Some of you may remember from earlier posts that my great-aunt, Wylly Folk St John was a children’s book author who enjoyed a good bit of success with the mysteries she wrote primarily during the 60s and 70s. 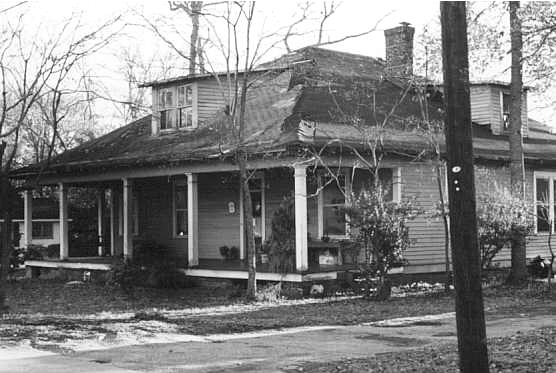 I’ve mentioned how she also wrote for years for the Atlanta Journal and Constitution and how she gave the very best presents on birthdays and at Christmas, but I don’t think I’ve shared much about the house she lived in with her husband, my uncle Tom. I believe my sister Margaret sent me this old photo of their home. I’m not sure when it was taken, but it looked much better than this when I was growing up. I have some very clear memories of their home in Social Circle. With a name as inviting as one suggesting a gathering of friends, I sometimes wonder if it was the name that drew her to the small town or its proximity to Atlanta where she worked part-time for the newspaper. Pictures of this house take me back and I can almost hear the rustle of her clothing as she moved though its rooms and the unique sound of her voice calling to me to join her in the kitchen. Lyrical with an edginess that’s difficult to explain, her southern born Savannah raised roots were very apparent, but didn’t dominant her accent as much as the rise and fall of her speech patterns. Writing this now, I wonder if there’s a recording somewhere of her speaking. My cousin Jenny sent me a friend suggestion on Facebook this morning for the woman who is living in Aunt Wylly’s old house now with her husband. Say what you will about Facebook and privacy issues, but being able to meet the people even if only virtually through the internet is a gift with surprise deliveries like the one I received this morning. Jenny said they’ve done a wonderful job restoring the house and have some great stories about the process. It shouldn’t be hard to guess who I’ll be sending a message to when I have a minute. You know I’m keen to hear stories in general, but to learn more about things they may have discovered in the renovation process, I can’t even begin to tell you how excited that makes me! Jenny is the blond child in the photo below. She and her sister Becky were flower girls at my mother and father’s wedding on a December day during the last few weeks of 1959. We haven’t seen each other for years due to geographic distance and opportunity and our communication has been limited to sporadic letters and Christmas cards until recently when we renewed our contact through Facebook earlier this year. Writing this post, I thought about how Facebook is a sort of virtual social circle and while not the Social Circle that Aunt Wylly called home; Jenny’s link and friend suggestion have created an opportunity for me to meet someone I might never have met otherwise. What do you think about social networking sites like Facebook, do you love or hate them and have they brought you any new friends or reunited you with old ones you didn’t expect to ever see again? 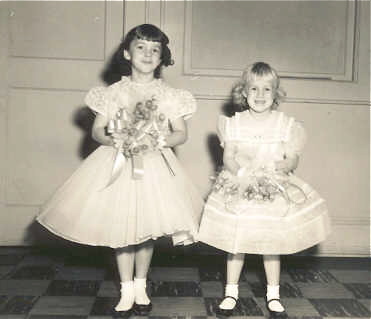 This entry was posted in Books, Choices, Family, Memories, Writing and tagged 1959 Wedding Photo-Flower Girls, Children's Books, Elizabeth Harper, Facebook, Gifts Of The Journey, Social Circle, Wylly Folk St. John. Bookmark the permalink. What a great story. I have heard of your great aunt, probably from her days at the paper. Facebook is sort of a blessing and a curse. I learned yesterday of the death from cancer of an old schoolmate of mine. While we were not friends, we knew each other from childhood and I was sad to hear of his death. I think you’re right about the virtual social circle. I wonder what our predecessors would say! Wonderful images! Elizabeth, Thank you for your great blog. Your stories, the new serial story, the accounts of your travels, and the photos you take have all captivated me. I rarely comment–though mentally I do! Responding today to comment on social networks. As a child I had a very dear friend, Kathy, who lived near me and then her family moved away when we were 8. We corresponded for a while and then the letters phased out. I’d think of her from time to time and eventually did some searching (to no avail) on the internet–her last name was not very common. I’m now living back in my hometown in Michigan where a local business has made a name for its self and has a website and is on Facebook. A year ago as I perused it’s page I saw a comment by someone with a familiar surname. Kathy’s sister! I was able to contact her–she lives in Maine and was reconnected with Kathy who now lives in Saskatchewan. We are once again in touch and continue to catch up on the 52 years during which we were separated! Yes, social networking can have its virtues! I live in Social Circle and pass by this house nearly every day. I also recognize the historic register plaque to the left of the front door. The date is usually only a “built circa____” but the town was established in 1828. Sherman marched thru here on his way to the sea on what is known as one of the oldest trade routes in our area, “Hightower Trail”. If it wasn’t for this social networking site I wouldn’t have the pleasure of reading your blogs and making contact with many from my sporactic childhood. I have made contact with the 1st girl to play Little League baseball in Georgia I hadnt seen since I was 9, a man who know sells real estate I knew in Virginia since was 12 and quite a few from Marietta I haven’t seen since 13. I’m beginning to shows signs of “ripening” at the grand age of 51 next month! Dang, I almost forgot! Facebook has made the world come back closer to home and made the expanse of time and distance seem seem so much shorter. This has many good instances, some bad and a detriment for a few. I wouldn’t know you without fb, it would have just a one off meeting – or maybe no meeting at all if you count blogs as social networking sites. So, a blessing for me. Your aunt had the best name for a writer that I’ve ever heard. How lovely that you made this contact. For all the time-sucking Facebook can be, stories like this show where its true value lies. I like FB and similar networking sites if they are used properly and for purposes that you describe here. They can be a time waster. I try to keep just a few friends on there and use it wisely. This is a wonderful story, and I’m so glad you made the connection! I hate, with a passion, the Facebook interface. Is a message to one person visible to all? Who knows, as there’s no way of telling visible to the naked eye. How to unfriend someone? Ditto. Love the social networking concept, but FB execution does not deliver to my mind. Not that I feel strongly about this, you understand – hah. Wow, that’s an awful pic. of the house. I never saw it that way. It must’ve been taken before 1969. I’m glad she put a new roof on the house. She had front steps, too. The front porch of the house continued around the left side of the house. Then later she had it closed off and made into an area meant to be used for crafts and sewing. It’s just hard to see it all to be able to tell. After 4 hrs. of being on FB, my curiosity will have to wait. Elizabeth, I’m so glad I found You! Since I’ve always had a wide circle of acquaintances and friends, FB just feels like an extension of that. What’s been amusing is that my husband refuses to join, and so I have friend requests (and then comments) from HIS colleagues. I’m even staying in touch with people for him. I guess it’s one perk for an introvert like him being married to an extrovert. I don’t log in all the time, but it’s nice to have a quick, easy way to get news out to people I care about. It’s also nice to have a general sense of what’s happening in people’s lives. It means that when we have a chance to really talk, we don’t have to waste as much time in the catch up phase. fb is nice to keep up with relatives, friends and get in touch with others. But a little dab will do you when it comes to taking up too much time. what a great story – reconnecting with bits of your past in an unusual way . i enjoy FB – it’s allowed me to reconnect with many old college, even elementary, friends that I had lost touch with through the years. I think the photo was taken in the 90s. My childhood friend lived there and you could hear some strange things after dark.Anyway even though it was in need of a lot of repair it was still beautiful on the inside. What a beautiful story of how our VIRTUAL social circle can connect with our past, present and hopefully our future. I wrote an educational blog post about the dilemma I face as an educator with combining our virtual social circle with our immediate social circle. Is it possible to be “present” and “online” at the same time? I think so and hope so as I navigate this in my classroom.